To develop students` interest in design, construction and technology. • To encourage students to develop their team working skills whilst finding and building a solution to a previously unseen task. • To encourage groups of neighbouring Rotary clubs to work together within and across districts. 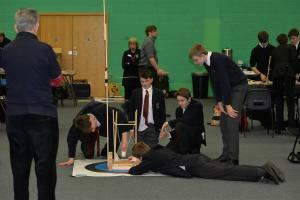 The Harrogate area technology tournament for schools was held on 5th February. Many thanks to Brian Souter for these photos. More will follow when all the area tournaments have been held. Following on from their success at Youth Speaks South Craven School took two of the three prizes at the Dales Group Technology Tournament with wins at KS3 and KS4. Giggleswick School took the KS5 prize to avoid the complete dominance of South Craven. 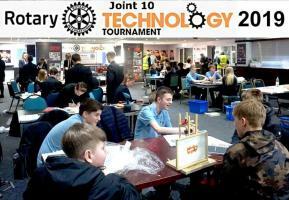 Eighty eight young people in teams of four students from seven schools across North Yorkshire attended this year’s Rotary Club Technology Tournament at Catterick Garrison. For the fifth year running, students from Leeds schools participated in a Technology Tournament run by Rotary Clubs in the Leeds area. 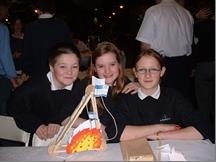 43 teams from 14 schools competed in the 7th York Technology Tournament held in the National Railway Museum. In a packed hall 122 students comprising 32 teams from nine schools in Calderdale at 9.30am on 6th March opened their instruction envelopes to discover what this year’s challenge was all about. A small selection of photos from the York Clubs tournament held at the National Railway Museum.456 teams entered from 12 schools.